Haul it all with one easy roof rack system! 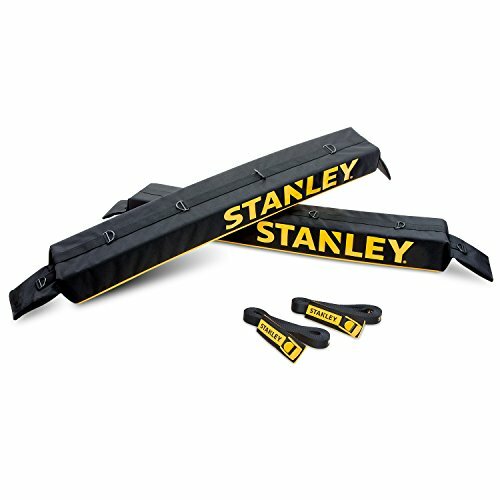 Safely transport your surfboard, skis, snowboard, kayak, stand-up paddle board and other bulky camping and outdoor sports gear with this durable Roof Rack from Stanley. Serving as a dependable load carrier and universal hauler, the set comes with two portable, lightweight pads that easily protect the roof of the vehicle from scratches and other damage, while the integrated loops allow easy strap adjustment and are capable of supporting up to 110 pounds of gear. Whether you're bringing home furniture, going on vacation or lugging along some large, long, unwieldy athletic equipment, your car's roof stays safe, clean and scratch-free for the entirety of the trip. Once you've reached your final destination, Stanley's simple assembly and disassembly has you stowing the rack away in a matter of seconds. Discover a faster, easier, safer way to pack and play-and add a Stanley Roof Rack to your cart today!